Hello dear stamping friends: With all the fabulous stamping positioners we all have and enjoy today, woodblock rubber stamps are not used as much anymore, even if they are still available. So, when I bought my MISTI I decided to convert all of my wood block stamps to plain rubber to be able to use the MISTI to stamp my images, I don't even put the foam on them, I use them just like that, plain red rubber and it works great. But, I couldn't just throw away these beautiful woodblocks, they are so smooth, with awesome natural woodgrain designs on them and I knew there must be something useful I can use them for. So I kept them on a box in my craft room closet while figuring out what to do. 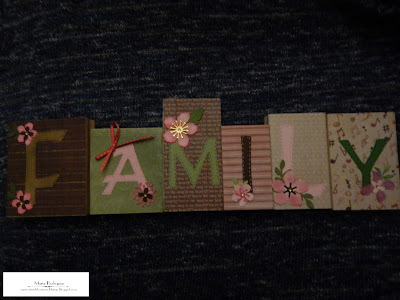 They got forgotten for a while until the SHOPPING OUR STASH challenge came out with this theme, "RECYCLE/REPURPOSE" and then I knew I had finally found a way to convert this beautiful wood blocks into something really cool and pretty and decorative. I found on Pinterest a lot of great ideas so I CASEd a couple of them and here is the result. I hope that, if you are keeping your woodblocks from old rubber stamps, you get inspired to give them new life and help you decorate your home for any Season and/or occasion. Or, look around your house, put your creative juices to work and find something that might not look like much right now and turn it into something totally awesome. Here is what I came up with, hope you like this project. Super easy to do, you can either paint them or, cover them with scraps of pretty pattern paper like I did for my Family blocks so it's a double benefit here to use all of those scraps of DSP we just can't throw away. The letters were cut with my Cricut machine, I don't use it as often as I should and this time around, it came in really handy. The flowers on each block were from my little stash of leftovers from the "Botanical Blooms" die set. I apologize for the darkness of this image, I couldn't get the flash to work, grrrr!! Please visit the SHOPPING OUR STASH challenge blog and check out what my teammates created for your inspiration and come and join us in our gallery, I'm sure you have a few things somewhere in your craft room or around your house that can be converted into something beautiful as well as useful.